Collectors of Russian Poland will know the "Morning" and "Evening" arrival markings of Warsaw. They are quite common and a nice collection of them can be formed. 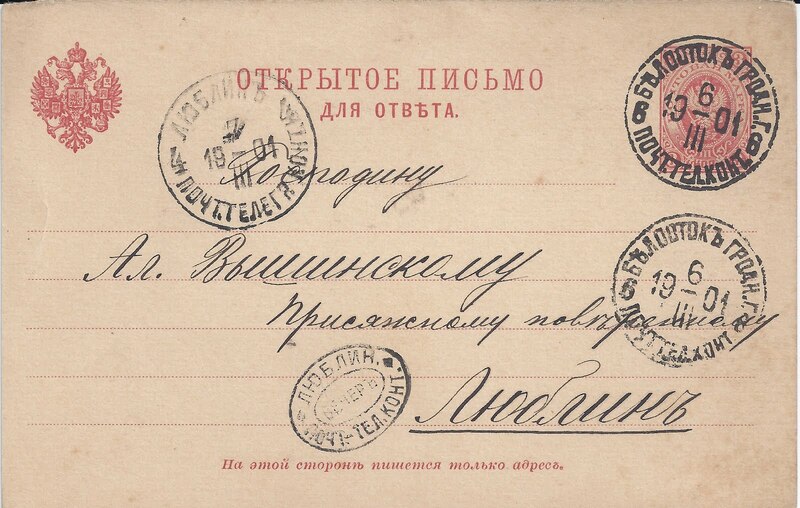 On the card above is an oval "Evening" arrival mark of Lublin. This is the only example I have seen. The card travelled from from BIELOSTOK GRODN[o]. G[uberniya] 6 III 1901 to LUBLIN 7 III 1901. The oval mark is inscribed "LUBLIN." at the top and "POCHT.-TEL. KONT." at the bottom; in the middle is the (unabbreviated) word "VECHER". This item was in the Jack Moyes collection; it is for sale.